A 47-year-old man has been jailed for more than four years for what police said was "the most sustained and diverse" art forgery case ever. Shaun Greenhalgh, from Bolton, passed off scores of faked artefacts and artworks as genuine. His mother Olive, 83, was given a 12 month suspended sentence for her part in the con. His father, George, 84, will be sentenced at a later date. 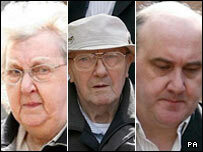 All three admitted fraud and money laundering at Bolton Crown Court. The court heard how a fake Egyptian statue was "knocked up in three weeks in a garden shed" by Shaun Greenhalgh, who cared for his parents at the home they shared in Bromley Cross. 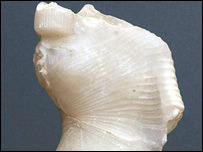 Bolton Council paid thousands of pounds for the so-called Amarna Princess believing it was 3,300 years old - but three years later experts found it was counterfeit. The statue was said to represent one of the daughters of Pharaoh Akhenaten and Queen Nefertiti, the mother of Tutankhamun. Judge William Morris, sentencing Shaun Greenhalgh to four years and eight months in prison, said the three had conspired together to defraud the art world for 17 years. He told Greenhalgh: "This was an ambitious conspiracy of long duration based on your undoubted talent and based on the sophistication of the deceptions underpinning the sales and attempted sales. "I speak of your talent but not in admiration. Your talent was misapplied to the ends of dishonest gain." Peter Cadwallader, prosecuting, said Greenhalgh's house in Bolton was "the centre of a major cottage industry in the production of fake antiquities and art". He described Shaun Greenhalgh as a "gifted artist", and said his father, George Greenhalgh, had "fooled experts from all the great auction houses as well as people from Vienna and New York". The trio had probably made £850,000 over the last two decades and could have earned at least £2m more, he told the court. The scam came to light after George Greenhalgh presented three faked Assyrian reliefs - ancient stone wall art - to the British Museum for examination in 2005. Errors in the cuneiform script - in effect, spelling mistakes - prompted museum officials to doubt their authenticity. They alerted the Metropolitan Police's Art and Antiques Unit which began an investigation. Speaking after the hearing, Stephanie Crossley, assistant director of adult services at Bolton Council, said the purchase of the fake had been "regrettable". But the council had carefully followed established practice in buying the statue, she added.